Pyone Kyaw holds a M.Sc. in International Development from the University of Birmingham, UK and is currently a governance adviser at the UK Department for International Development in Burma where she is advising and managing various civil society and governance programs with particular focus on parliamentary strengthening and electoral support including electoral observation and voter education. 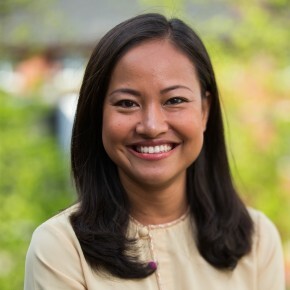 Pyone pursued studies in education and English and started her early career as a teacher for marginalized students in rural Burma where she witnessed great disparities between the rich and the poor and was committed to working for the development of the country’s young people. She then became a civil society leader dedicated to improving quality of life and empowering young people in Myanmar/Burma. Before joining the Sauvé Scholars Program, Pyone established Youth Development Initiative Network (YDIN) – a youth forum that became a driving force to strengthen civil society movements in Myanmar. She also worked as a communication officer with the Shalom Foundation, a local NGO focusing on peacebuilding, conflict resolution and development. Pyone also participated in a year-long research exchange program in the Philippines, supported by the Fredskorpset of Norway in partnership with five Asian and African civil society organizations. In the Philippines, Pyone carried out community research projects on education for sustainable development and indigenous peoples, and explored the issue of Peace Communication in the southern Mindanao region. Upon completion of the programme in the Philippines, in 2008, Pyone applied communications and leadership skills obtained from the programme in the Philippines to assist victims of Cyclone Nargis back in Burma by facilitating the delivery of psycho-social support services to women and children. Upon completion of the Sauvé Scholars Programme, Pyone returned to Burma and continued working for Shalom (Nyein) Foundation in Burma as partnership programme coordinator and worked on 2010 Myanmar pre-elections capacity building projects. With the project, Pyone led exposure trips for ethnic political leaders and candidates to learn from experiences from the neighbouring countries such as Cambodia, Thailand, Philippines and Malaysia. Following the pre-election period, Pyone was chosen to lead a citizen election observation core team and more than 800 long term and short term observers throughout the country. The final report, ‘2010 Myanmar General Elections: Learning and Sharing for Future’, was published and it served as a crucial foundation for civil society groups to continue the election observation and monitoring endeavours for the future elections in Burma. Subsequently, she also became involved in post elections capacity building programme where work with the elected ethnic parliamentarians, opposition and ethnic political parties and civil society advocacy organizations on policy formulation, implementation and monitoring. She also maintained her involvement with other civil society movements on gender equality and social accountability until she was awarded the prestigious Chevening Scholarship for her studies in the UK. Read My Life as a Sauvé Fellow by Pyone Kyaw. In May 2015, Pyone returned to Sauvé House to participate in Sauvé Encore! 2015 as part of the Foundation’s alumni outreach program.